Join Ralph Pullinger and Jonathan Croft for this webinar which will introduce the tools within Allplan Architecture that provide Architects complete creativity and project control. Allplan Architecture is tailored to produce detailed design drawings, enabling unparalleled information quality. Reliable and traceable quantities and costs. With the new actionbar in Allplan Architecture 2018, you will find the tools you need for your particular tasks via a series of ribbons. The actionbar is structured according to different roles and tasks so that function groups, such as modelling, drafting or visualisation, are available to you. Enhanced development in the area of 3D modelling in Allplan Architecture 2018 allows you to implement your visions without compromise and with the highest level of precision. With the combination of Allplan Architecture 2018 and the BIM platform Allplan Bimplus, you can easily handle the exchange of thousands of pieces of information in BIM projects. You can use Allplan Bimplus to centrally define information and then use it in different systems and disciplines throughout the entire life cycle of a structure. Buy Allplan Architecture today or get started with a free 30-day trial! Rapidly reinforce any complex object. ALLPLAN, a leading vendor of BIM solutions for bridge engineering, is pleased to be attending this year’s Bridges 2018 Annual Conference – the heart of Europe’s bridge community on the 14th of March in Coventry, UK. In its 26th year, this one-day conference brings the latest trends and developments in building bridges in the UK. The conference will deliver up-to-date information through a number of technical sessions and case studies. The annual event brings together some of the sharpest minds in the bridge sector to debate and discuss all the latest challenges and opportunities for bridge engineers and managers. Allplan has supported bridge projects for over 30 years, playing a key role in promoting digital solutions for the bridge and engineering market. Come stop by the Allplan stand (C06) where Allplan will be demonstrating our BIM solutions for superior and productive workflows. Fast production of quality drawings and deliverables. 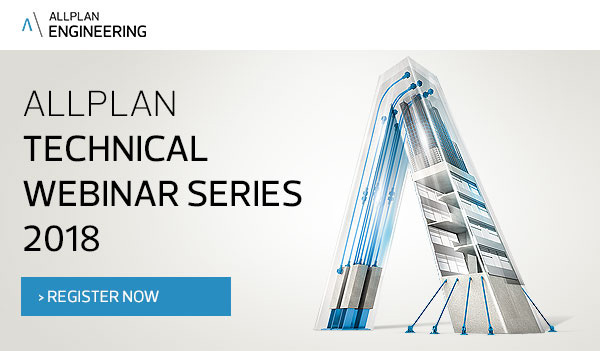 The second in a series of Allplan technical webinars will focus on Bridge Modelling. This webinar will introduce the bridge modelling capabilities with Allplan Engineering that enables modelling of bridge structures. Allplan Engineering’s bridge modelling will help you raise your level during the design stage to unlock greater project design efficiencies.